When your only real and necessary goal is to be better than San Andreas, you’ve succeeded in placing the bar so low that almost anything you produce will be a stunning hit by comparison. And I’m only knocking San Andreas slightly; it was an entertaining disaster flick, though not even close to a commendable disasterpiece. 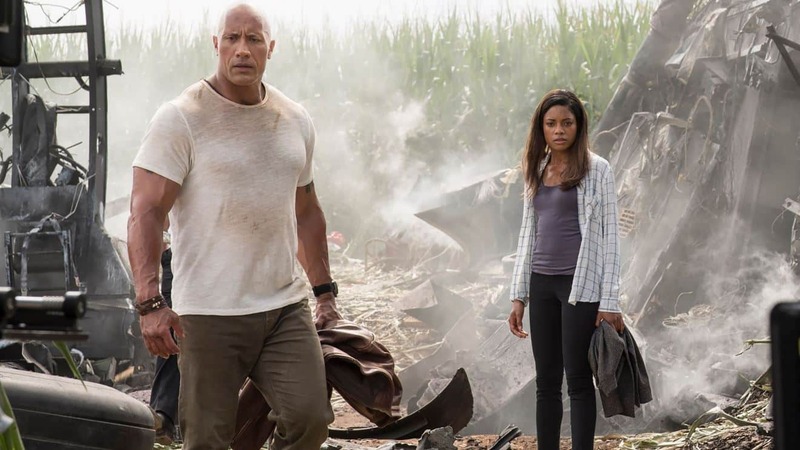 Rampage only had to be marginally better, only needed a slightly better script, only had to cast slightly better actors to work alongside the natural charisma that is The Rock, in order for us to stand and applaud. I’d say it got about halfway over the line it was aiming to cross before falling limply on its side and passing out, which is just another way to say that Brad fixed some problems from he and Dwayne’s other attempts, but not all, not by a long shot. 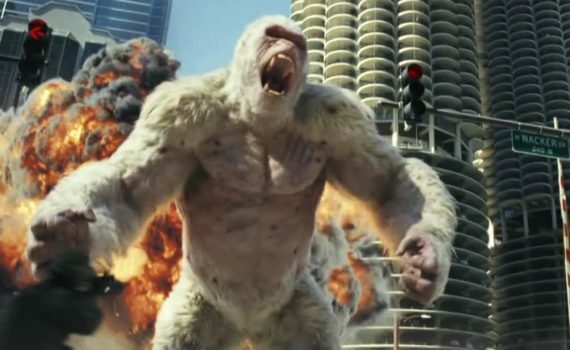 Rampage is still problem-ridden, and yet still a good time; this genre is frustrating if only because audiences are programmed to enjoy the destruction, I just wish the destroyers would do a better job. Davis Okoye is a primatologist in San Diego working with gorillas, some of which he saved directly from the poachers traps. Animals are his passion, and he finds that he has a difficult time relating to people; how they lie, how they ruin, how afraid they are, how quick to anger. His best friend is an alpha male named George, who he rescued as a baby, and who he can talk with though a series of signs. When a corporate experiment in space goes haywire and destroys its station, some of its pieces crash back down to Earth, one of them right in George’s enclosure. Suddenly, this peaceful creature is now an aggressive monster, one that is growing in size every hour. Davis and a disgraced scientist, Dr. Kate Caldwell, will have to figure out what changed George, how many other animals might be affected across the country, who is to blame for the technology, and how to stop them from destroying America’s cities in their ever-blossoming rage. I played Rampage as a kid; it was one of my favorite NES games. My sister and I would rent it from the local store, play for hours, and then we’d have to leave it on all night, because at that time there wasn’t a save function. When we got back on the system in the morning, it would be red-hot and buzzing badly, but we’d finish the game, take over the U.S., and feel pretty accomplished. She was always Lizzy, I was George, so this movie speaks to that kid in me, that nostalgic piece that will always remember the good times I had with this game. The film version does a great job of recalling the destruction and the chaos surrounding the game play; climbing buildings, punching holes in them for no reason, stomping tanks, dodging airplanes, crashing down with the rubble. I even spotted the arcade version in the office of the villain, so good on the filmmakers for letting me relive a sliver of my childhood. Now for the movie, which is basically so bad it’s good. San Andreas was cheesy and unbelievable; Rampage is more fake, which makes it more fun. Don’t get me wrong, it’s a terribly simple and ridiculous plot filled with some of the worst dialogue you’ll ever hear, but it’s also full of goofy moments and pure mayhem that make the experience of watching worth the time. Some of the worst lines were saved for Malin Akerman, who was the cunning head of the evil corporation. She and all of her words were so bad you’d think George wrote them; I would swear that someone was sabotaging her career, but I’ve already seen her in enough to know that her talent level has done that itself. The Rock was cool, as always, he was a good hero, he and George worked together as characters, and, again, the plot was so silly and easy and linear that it kinda worked. 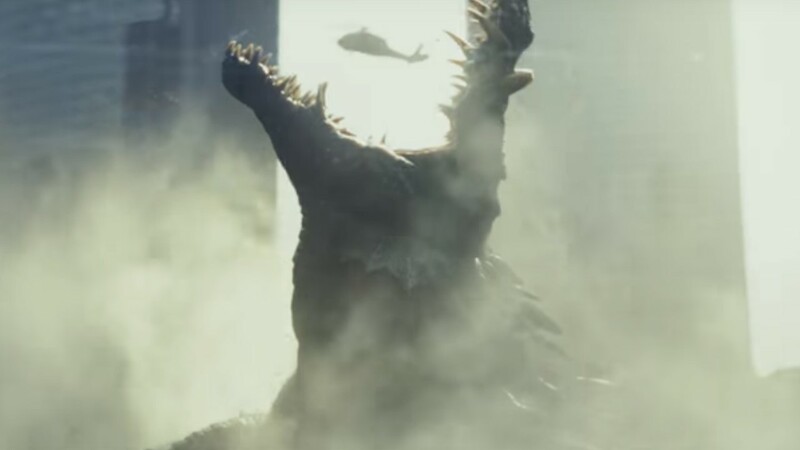 Buildings fall, Chicago is attacked by a crocodile, people are eaten; not a bad way to spend an evening, especially if you are a fan of the original content and are ready to root for a little absurdity.